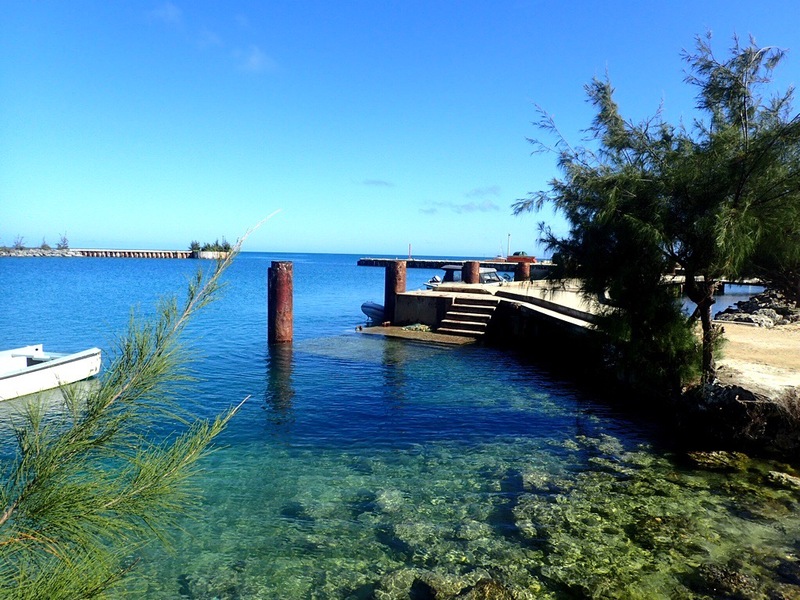 Unusually, the weather is treating us to perfect conditions for island hopping around this remote and exposed area of Tonga, the Ha’apai Island group. We have plenty of sunshine and the winds are light. The islands are low lying, overgrown with palms, shrubs unknown and bind weed, tons of bind weed, they are surrounded by beautiful sandy beaches and treacherous reefs. Mostly uninhabited, you almost expect Robinson Crusoe to appear, at any moment, from the interior undergrowth.The sky is huge and filled with wispy clouds, the sea is clear and full of whales. 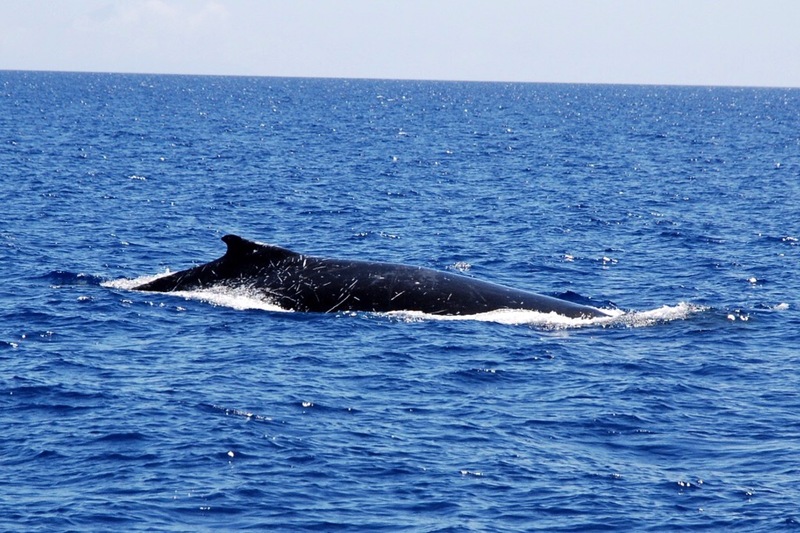 On the two hour trip from Luangahui island to Ha’afeva today, we saw nine separate groups of whales, it was like sailing through whale soup. Having got our cruising permit, Tuesday morning we popped back into Pangai to pick up some fresh bread, before setting off to explore the islands. We are assuming there will be no more services until we reach Nuku’alofa in a couple of weeks. Unfortunately popping is not something we can achieve very easily. The tide was high and the dingy dock and cleats sat under a couple of feet of water, paddling and wall climbing were required to secure the dingy safely. At the first store a request for bread was met with blank looks, at the second it was as if we had enquired about some rare and exotic ingredient. Finally we were guided to the ‘green’ store and bread was purchased. In our absence the dock had filled with local boats, getting back into the dingy necessitated an ungainly scramble down four feet of wall while limboing under several lines. 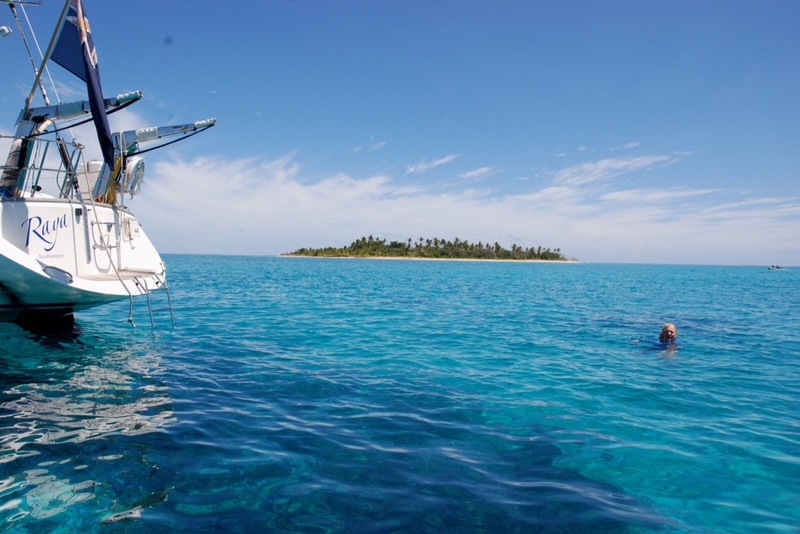 At midday we finally lifted the anchor and motored five miles south to Uoleva island. 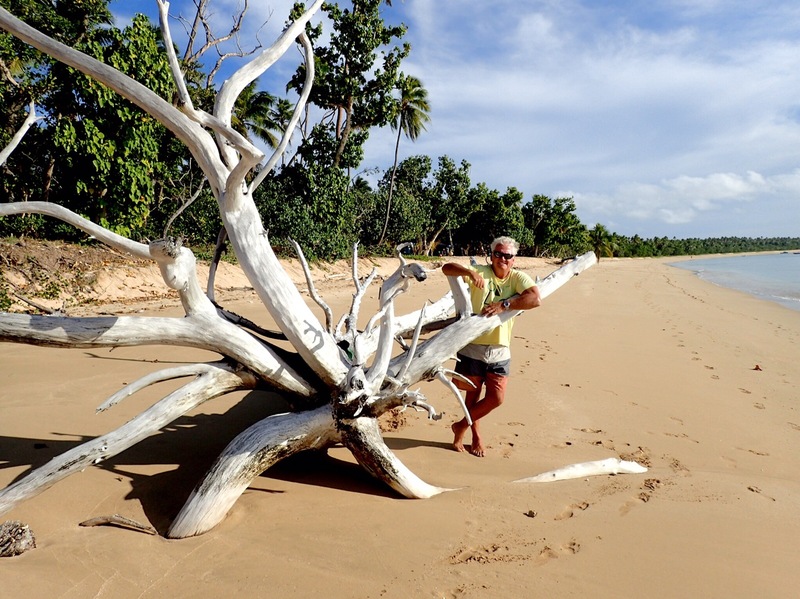 The beach here is a mile and a half of golden sand, it is littered with amazing fallen trees that have been gradually buried in the sand, bleached and smoothed by the wind and sea. Tiny crabs run at lightening speed up and down in time with the waves. A palm filled jungle fills the interior. From the boat the island looks uninhabited but for, rather strangely, three volley ball nets spaced along the shore. On closer inspection amongst the trees, hidden from sight, there is a back packers resort one end of the island and a camp site the other. Right in the middle of the bay is the small Sea Change Resort and Uoleva Yacht Club, which comprised of a couple of cabins and the best beach bar we have yet found in the Pacific. The young English couple, that had just newly arrived as managers, gave us an extremely friendly welcome, it was beachcomber in style and the food was excellent. The only problem was yet again finding a safe spot for the dingy. The beach was steep and the swell was big enough to create breaking waves. At lunch time we anchored a way off and swam to the beach, but we didn’t want to eat dinner in wet swimmers so we risked anchoring closer in. This turned out to be a mistake, while we chatted at the bar with the resort guests, the dingy was pushed by the swell too near to the beach and the waves slowly filled it with water, Rick spent the rest of the evening bailing. 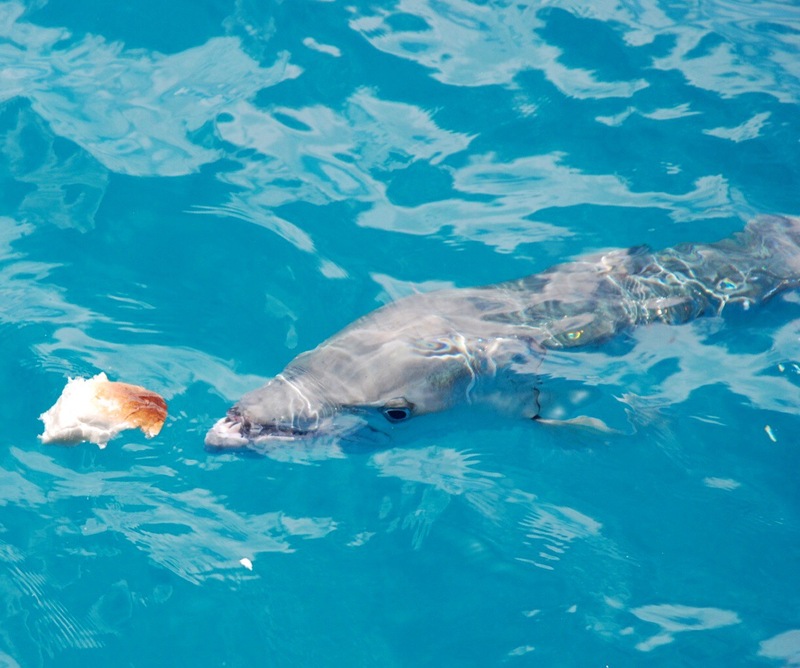 Back at the boat we had a large friend to entertain us, a 5ft long Great Barracuda had taken up residence under our dingy, we tempted him out with bacon and as he snapped it up his rather large teeth were revealed, all thoughts of a cooling swim were forgotten. With the wind turning to the west the anchorage off Uoleva became a bit of exposed, so we moved on towards the tiny island of Luangahui. The anchorage here is encircled by reef, using the information from a couple of Tongan cruising guides, our two sets of electronic charts and Google Earth, I carefully plotted a route in. When we got there however, we for some reason ignored all that, missed the channel in and found ourselves surrounded by bommies and with only a meter under our keel. Rick very carefully menouvered us into deeper water and we decided perhaps this spot was not for us. But just as we turned away I spotted a dingy racing out towards us from the one boat that was already in the anchorage, Tony assured us the channel was fine and explained where the entrance was. We felt slightly vindicated when the next day the large motor boat, Iceberg, came round the corner and tried to do exactly the same thing as we did, it was now our turn to help them out. We owe a big thank you to Tony and Angela on Tanavika, we were so glad we stayed, it really was an idyllic spot. Luangahui is only 200m across, we walked around it in just 20 minutes, the water was crystal clear and sparkled pale green in the sunlight. We were anchored in just 4.5m, a bit out of our comfort zone, but shallow water made for great swimming and snorkelling from the boat. As we have found everywhere in Tonga the coral is not in good shape, damaged either by the cyclone that swept through a few years ago or bleached by rising water temperatures. The underwater landscape however was fascinating with large ravines and a miriad of different coral structures reminisant of an alien cityscape. The fish were small but plentiful. As Rick cooked us steaks on the BBQ, we watched whales fin slapping and breaching just outside the reef and in the evenings we were treated yet again by spectacular sunsets. A special couple of days. Today we motored in very light winds to another island, Ha’afeva. With a calm sea it was easy to spot whale activity and there was literally whales everywhere we looked, we turned off the engine a couple of times to see if they would approach us but they all kept their distance. We have decide they are well named as humbacks, despite their gregarious behaviour, slapping and jumping, the only thing we seem to catch on camera are their humped backs. Thanks Chris, can’t get enough of the whales. 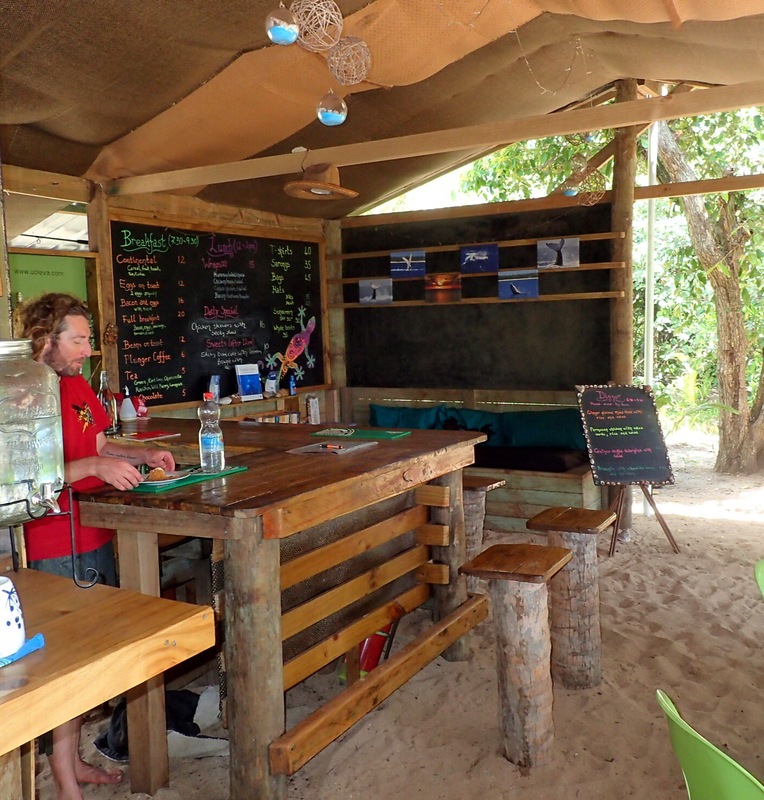 Thanks Lorna, just arrived in Nuku’alofa and added some pictures – one of the bar.